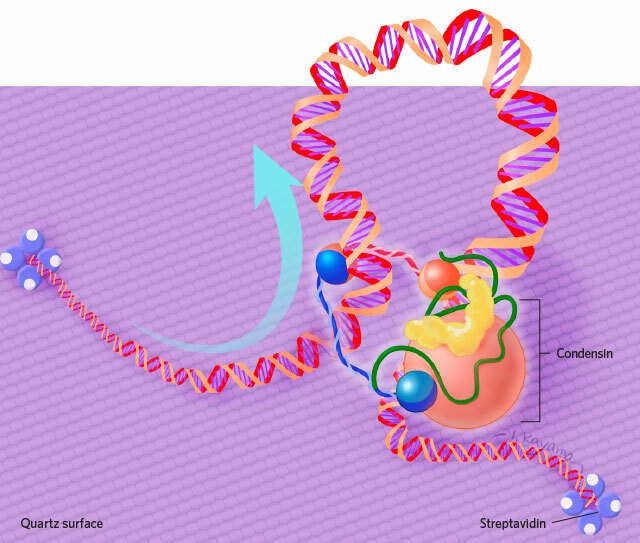 ASYMMETRY: Researchers anchored a DNA strand to a quartz surface using streptavidin and watched as the protein complex condensin latched to the nucleic acid and formed loops. 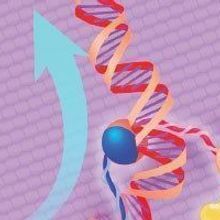 Contrary to previously established computational models of loop extrusion, which predicted that the two sides of the DNA strand would be reeled in simultaneously, findings from this study suggest that condensin anchors itself to a piece of DNA and reels in the other side. 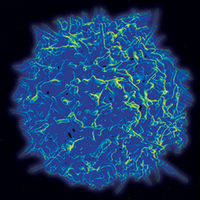 How does a human cell neatly pack more than 2 meters’ worth of DNA into 46 tiny chromosomes? One popular theory is that, with the help of a large protein complex known as condensin, DNA forms many compact loops. One of the earliest pieces of evidence for this process arrived in the 1970s, when a pair of biochemists observed loops of DNA in electron micrographs of HeLa chromosomes. 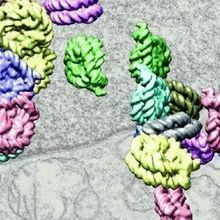 Researchers later pinpointed condensin as a key protein complex involved in forming these structures, yet “how it works has been completely unknown,” says Christian Häring, who investigates chromosome structure and dynamics at the European Molecular Biology Laboratory in Germany. Some scientists have proposed that condensin binds to DNA and extrudes looped strands, but no one had directly observed the phenomenon. To try to catch condensin in the act, Häring and his colleagues tethered a long piece of biotin-tipped DNA to a quartz surface covered in streptavidin, anchoring the two ends of the strand in a microfluidic chamber. Then, they stained the DNA with a bright-orange dye and added a buffer, fluorescently labeled yeast condensin, and ATP. Watching through a microscope, the researchers saw that condensin gradually pulled the DNA into a loop, drawing on just one side of the strand. 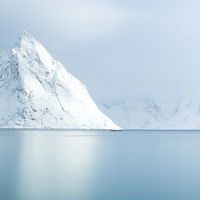 “A single condensin would grab on [to the strand], and like a motor, asymmetrically start reeling in the DNA,” explains study coauthor Cees Dekker, a biophysicist at Delft University of Technology in the Netherlands. “I was surprised,” says Häring. “I’ve been very skeptical that condensin could be this loop-extruding enzyme, because if you look at its structure, it’s not obvious how it could work as a motor that pushes out the DNA.” He adds that the details remain a bit of a mystery, which he and his colleagues plan to tackle next. “It was really great to see [loop extrusion] happening in real time,” says Camilla Björkegren, a cell and tumor biologist at the Karolinska Institute in Sweden who wasn’t involved in the work. However, she notes, it’s not clear whether or how the process might work within cells, where the nucleic acid is wrapped into nucleosomes by histone proteins.